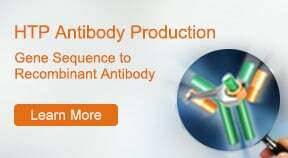 Production and purification of proteins with biological activity is essential in drug discovery. Multifunctional units at GenScript secure successful delivery of bioactive proteins based on our state-of-the-art equipment and methodologies. A case study below shows groups of protein production and assay development teaming up deliver enzyme with qualified specific activity, higher than customer expected. After modifying the method of cell-breaking, we increase the final yield of protein of interest with purity of above 90%. GenScript's protein team has extensive experience in bacterial expression and purification, protein refolding, solubility enhancement, endotoxin removal, and large-scale production. In a recent case, we have obtained 108 mg A fusion protein with >90% purity from 20 L E. coli expression and two-step purification. The concentration is 4.02 mg/ml and the endotoxin level is lower than 0.8 EU/ug. Purification of macromolecular complex subunits in large quantities and assembling them into functional entities are vital steps for successfully determining the structure and characterizing the functions of macromolecular complexes. Despite the fact that cases of isolation and structure determination of endogenous complexes have been demonstrated, great efforts still lie ahead to make this technology easily accessible. Recent endeavor on this subject suggests that co-expression of subunits within hosts of E.coli and insect cells, even for high-throughput projects, is becoming a promising solution. Overproduction of proteins in E.coli can cause the formation of inactive, misfolded and insoluble protein aggregates. GenScript provides proprietary refolding technology to solve this problem. A case study shows that over 95% of the inclusion body is solublized and refolded. 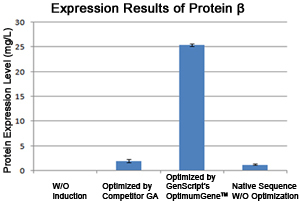 The purity of the refolded protein is more than 85%. 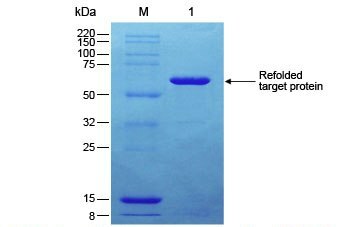 The refolded protein is delivered in customized buffer. Presence of epitope tag in recombinant proteins may result in changes in protein structure, toxicity, and loss of bioactivity. To avoid these problems, tag removal after protein expression is one of additional requests from some customers. 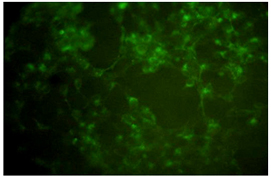 Shown below is protein that is cleaved by SUMO protease and successfully isolated. About 80% tag free target protein with purity of >90% is recovered. 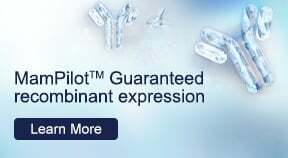 GenScript's proprietary YeastHIGH™ expression system and in-house YeastFast technology delivers unparalleled advantages in secretory expression. Pictured below is an enzyme expression performed using our YeastHIGH™ expression technology. After one step purification by SP-Sepharose, we find tag-free proteins at an expression level of about 20 mg/L and at purity level of over 90%. The target protein is further identified by MALDI-TOF. Shown below is the expression of a protease with signal peptide. 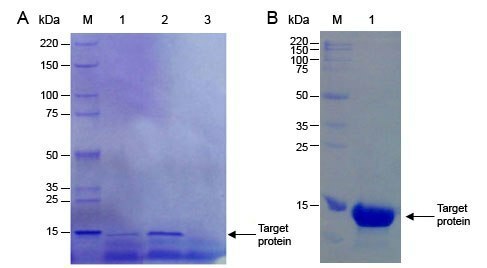 There was no secretion expression of target protein with Saccharomyces cerevisiae α factor prepro peptide. After changing the peptide sequence for secretion from α factor prepro to the native signal peptide of the protease itself, the target protein was expressed and secreted successfully. 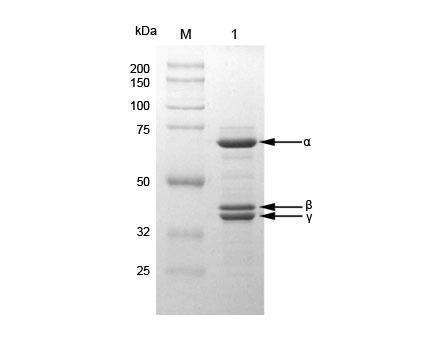 Customer's initial request was to synthesize the gene in question and to clone it into our BV vector for intracellular expression. The expected yield was 0.1-1 mg of tagged protein with over 70% purity. Based on a thorough sequence analysis, we designed a new strategy, which was approved by the customer, touse the protein's native signal peptide to drive secretion. In the end, we obtained 3 mg of protein with a purity level over 80% from 0.5 L SF9 CM. The protein's identity was further confirmed by MALDI-TOF. After protein expression, the conditioned medium was dialyzed against buffer, and loaded onto SP column. The predicted size of the target protein was 78 kDa. The SDS-PAGE results showed that proteins of the same size as the target had been obtained in lanes 12, 13, 14. 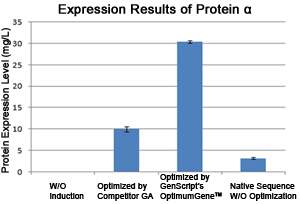 GenScript recommends its mammalian expression services for cases in which the folding of the proteins is crucial to the customer's intended application and cases in which the internal machinery of E. coli is unable to express the protein with desired conformation and modification. Our proprietary 293 and CHO suspension system platform promotes fast production and delivery of recombinant proteins and monoclonal antibodies up to grams level. To request a quotation, please download and complete the Quotation/Order Form, and send it to us by email or fax. To order, please download and complete the Quotation/Order Form and send it to us by email or fax with a formal PO (Purchase Order) or credit card information. You can also submit PO/credit card information by phone or via our secure online messaging system. If submitting samples, please mail them together with a hard copy of the completed Quotation/Order Form to: Recombinant Protein Services, GenScript, 860 Centennial Ave., Piscataway, NJ 08854, US. 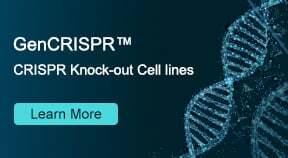 For questions about recombinant protein expression, or to inquire about the status of your order contact us by email, phone, fax or via our secure online messaging system.